Peter Bjorn and John, the Swedish trio behind the catchiest whistling tune of all time ‘Young Folks’, are back to wow us with their musical talents after taking a well earned break to build their own studio, start their own record label and perfect their effortless sounding pop music. 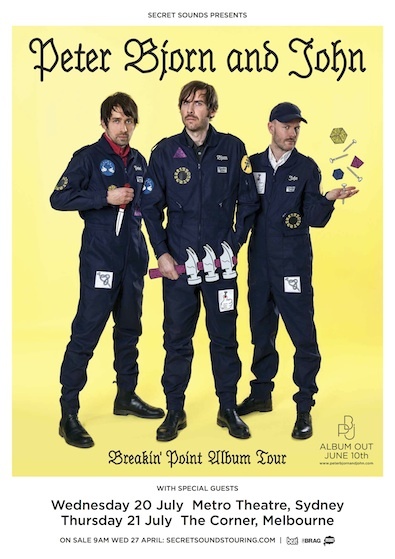 In April 2015, Peter Bjorn and John released their first new music in four years with one-off single ‘High Up (Take Me to the Top)’ on INGRID Volym 2, a Record Store Day exclusive double-LP of which there are only 500 copies. In July of the same year, the band debuted two new songs before officially announcing a forthcoming LP Breakin’ Point with the lead single ‘What You Talking About’. Due for release June 2016, their seventh album is a reflection of the band’s newfound search for (yet another) career high.